Sun-dried tomatoes give this vegan spaghetti squash recipe a savory pop. 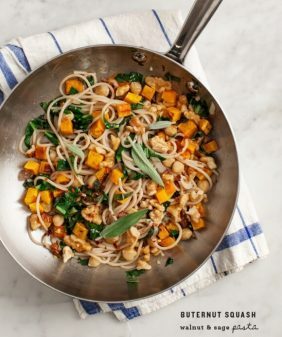 Hearty from chickpeas & kale, it's a great fall or winter weeknight dinner. The first time I had spaghetti squash, it was served with a big scoop of store-bought marinara sauce mixed in. It was slimy and goop-y and decidedly not spaghetti-like. About a month ago, ditching the pasta idea completely, I planned a post for bbq spaghetti squash tacos. I have a super cute photo to prove that the meal existed, but the recipe ended in total disaster. So, long story short, I’ve learned that I prefer my spaghetti squash as simple as possible and most importantly: sauce-less. The roasted strands come out of the oven with a nice al-dente bite, but, smothered in sauce, they become just too mushy for me. Check out this post to see how I cook spaghetti squash to get the yummy al dente strands you’ll want for this recipe. In this recipe, the roasted squash strands are lightly tossed with olive oil, garlic, rosemary, and a good squeeze of lemon. I added chickpeas and kale to make it a full meal and toasted some pine nuts for crunch. Sun dried tomatoes add a nice pop of flavor, but you could add anything briny that you like – capers, or maybe some chopped kalamata olives. So while spaghetti squash is not pasta and it never will be, this veggie-packed bowl just moved up my list as a healthy weeknight favorite. 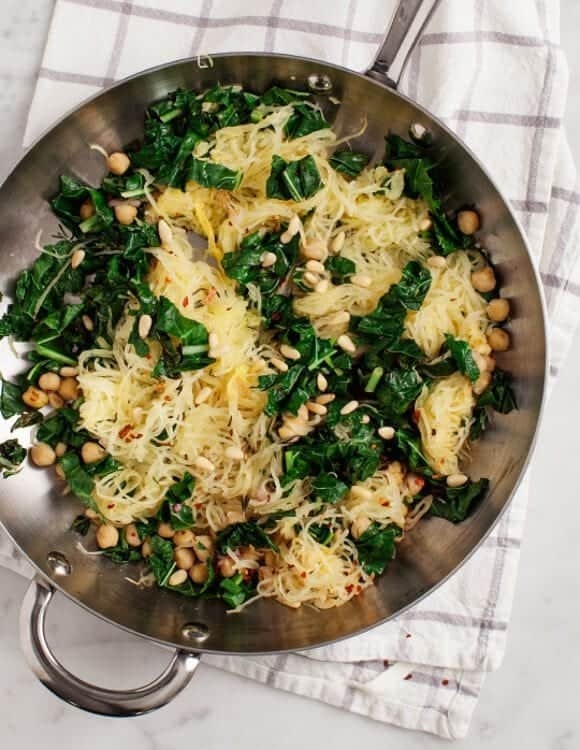 This easy spaghetti squash with kale is a great healthy weeknight dinner! Flavored with rosemary, lemon, and sun-dried tomatoes, it's a delicious vegan and gluten-free dish. Prepare your squash following the directions in this post. This looks amazing and I’ll definitely try it out! Pinned! I’ve always had spaghetti squash with marinara and also found it gets kind of wet, like it needs to be drained or something. Can’t wait to try your version. I love, love love spaghetti squash and also like it with marinara sauce. However, I make my own with lots of vegetables in it, so it is very thick. The secret is not to overcook the squash to begin with. it looks and sounds so delious. i wish i could find some spaghetti squash anywhere. somehow the seem to not sell them anywhere here. I am SO with you. I like my spaghetti squash sauce-less as well. 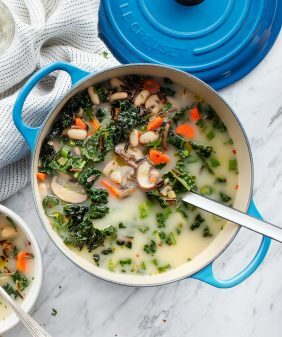 Love the chickpeas and kale in there. Yum! I’m going to keep a real look out for spaghetti squash from now on – you don’t often seen them in the UK and I couldn’t see how they would be non-mushy – but this recipe sounds delightful. So bright and fresh. I like your simpler approach to spaghetti squash. Allowing it to be its own thing rather than mimicking other foods should be a lot more satisfying anyways. The kale, pine nuts, and sun-dried tomatoes look like a great combo here. YUM! 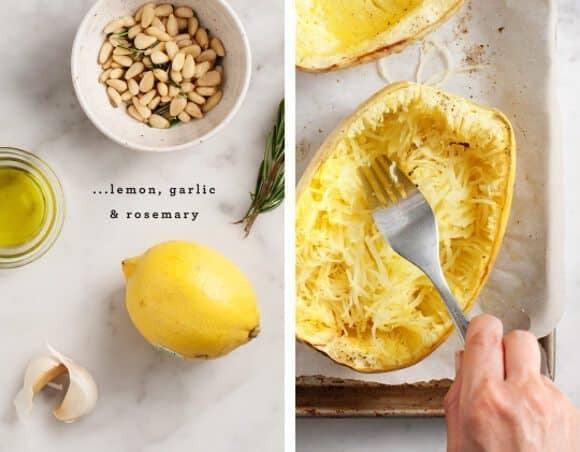 This makes me want to go out and buy a spaghetti squash ASAP. Yes, I love this idea. I think that spaghetti sauce should not be seen as a replacement for spaghetti, but something entirely different. I love the sauce-less idea! Definitely going to try this. Not a fan of sun-dried tomatoes so I think I will try the olives! I have to agree with you. It always turns up slimey and watery for me when I add sauce. I cannot wait to try this recipe though. Thank you for the inspiration! I definitely agree that spaghetti squash treated like actual spaghetti leaves something to be desired. 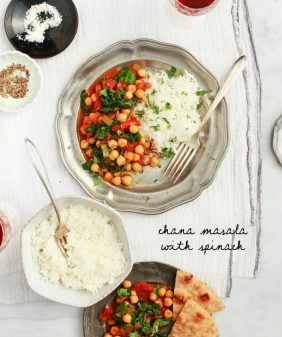 But this combination with hearty greens and chickpeas sounds fabulous! 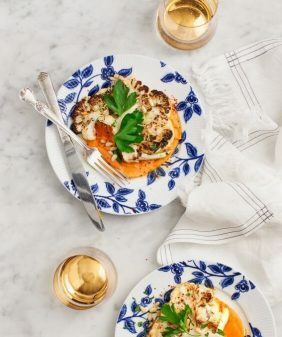 I am such a lover of spaghetti squash – and this looks so good! Loving your simple approach and how versatile this is with any veggies. Putting it on my list to try next week! I have always wanted to try spaghetti squash but I have NEVER been able to find one. I’m iriginally from Australia and nor year I searched in fruit and veg markets everywhere, but no luck! 🙁 nowadays I live in Germany, but still haven’t spotted one here..! Any tips on where to find one? Aw, I’m not sure, maybe they’re grown more in the US than other places? uses that squash as the main foundation. This is a wonderful example. I’m a big fan of spaghetti squash, but I agree, the more sauce and toppings involved, the worse for wear the spaghetti squash gets. I’m trying to get some more of my family members on board with it, though. They tend to shy away from things like this, haha. What a beautiful dish. Love the simplicity of it, but at the same time it sounds so flavourful!! I can imagine how amazing this will taste; can’t wait to make it! Great post, I have never actually had spaghetti squash but i am def. not a fan of normal soggy spaghetti so will have to take your word for it and avoid sauce with spaghetti squash at all costs! This recipe looks great. bookmarking it! And – lovely photography as always. I made the vegan version and used capers. The mix of flavors is fantastic. Can’t wait to blog about this one!! I made this last night and it was absolutely delicious!!! This is definitely a new favourite in our house. Thank you! I’ve always found the same thing with spaghetti squash – way too runny and mushy when mixed with sauce even though the flavor is fantastic. I love the simplicity of this recipe – letting the spaghetti squash shine! This was my first time trying spaghetti squash and I really enjoyed this dish. I think the squash I used was unusually large so the ratio of “spaghetti” to toppings was a bit off. Next time I would add more of the “good stuff,” but great flavor combo nonetheless! I love this recipe! It was so easy to make-especially when you allow enough time for the spaghetti squash to cool. The flavors were refreshing and crisp. I always feel so empowered when I make such a colorful and fresh vegetarian meal! Thank you for all of the inspiration! Hi Samantha, I’m so glad you liked it! Made this dish yesterday and it was delicious! I substituted rainbow chard for the kale (I know it’s good for me, but I just don’t like it! ), and instead of sundried tomatoes, which I find to be too acidic, I roasted some cherry tomato halves tossed in olive oil, salt and pepper for 1 hour at 200 degrees, then for 20 minutes at 300 degrees. I really loved the combination of flavors and textures in this dish. Thank you for the inspiration! Delicious idea, it’s cooking right now on the stove and smells wonderful. I have gone with capers as I love them. Can’t wait to eat! I made this last night- the hubby and I LOVED it! Such a simple, fresh and light dish for the autumn and winter. I think you hit the nail on the head but letting squash be squash. The only other time I tried spaghetti squash, I did the marinara thing and it was hugely disappointing. We will be making this one again for sure! Hi Emma – yay, I love hearing about squash success! Glad you and your husband both loved it. All of my favorites, can’t wait to try this tonight! Thank you. I made this recipe for the forts time tonight and I have to say, I was so impressed. The flavors are perfect with one another! I pinned this recipe a couple months and I don’t know why it took me this long to make it! It was delicious and super flavorful. The sun-dried tomatoes are a really nice touch! I pinned this recipe a couple months ago and I don’t know why it took me this long to make it! It was delicious and super flavorful. The sun-dried tomatoes are a really nice touch! I started a mostly vegan diet and thought that i was doomed because i couldn’t find any recipes i liked. I figured I’d be stuck eating plain raw veggies. I just made this and it was sooooo good! I love the mixture of the different spices and all the different textures of the food. I will definitely be making this again! Aw, I’m so glad – I hope you find some more delicious things so you don’t feel so doomed! Where I am these squash vary in size, how large or small is the one this recipe uses? Mine was sort of medium in size – I’d say I used around 5 cups full in the recipe. Made this tonight. It was pretty good! Sun-dried tomatoes and pine nuts are what set it off. Spaghetti squash was just a wee bit mushy. Overall good, I would make it again. Update–This dish got better the next day, after the flavors had melded a bit. Will definitely make again! Just tried the recipe -Delicious!! I’m looking forward to making this tonight. Can I make the spaghetti squash ahead of time? I love spaghetti squash so this is a great recipe to try. The only downside is that spaghetti squash is hard to come by in the UK. I’ve seen it sporadically in Waitrose. Do any others in the UK have suggestions on where you can get it? This is delishious! Used dried rosemary and roasted sunflower seeds. I did not use cheese. This recipe has become one of our favorites in the fall/winter. I make it probably every other week. I use spinach instead of kale because my husband and I are spinach aficionados. I also add capers and use goat cheese instead of Parmesan. Add the goat cheese right before serving and it melts a bit to take on a creamy sauce-like texture. Fantastic! Hi Hope – that makes my day to hear! Your version sounds so delicious! this dish was INSANELY good!! can’t wait to make it again. used sundried tomaotes (not in oil) and soaked in water for a little bit before adding in. Terrific recipe that was easy to follow and resulted in a delicious dinner! 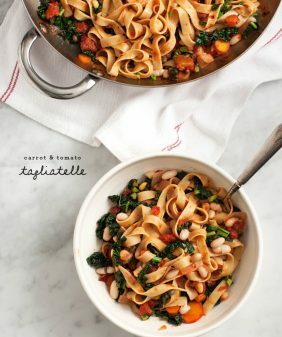 I’m making this tonight w/some sauteed mushrooms instead of sun-dried tomatoes and am quite excited. Thank you for the great idea!! sounds delicious, I hope you loved it! I just love this! I’ve made it a few times! I love spaghetti squash but I’ve never liked it pretending to be pasta, I found this recipe when trying to figure out what else to do with it! 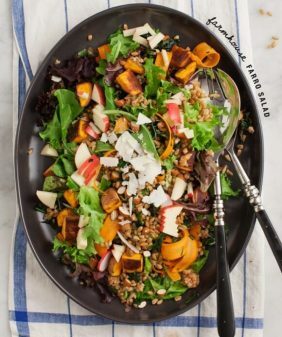 I also eat meatless a few times a week and this is the perfect meatless meal that is both filling and totally satisfying! Hi Melissa – I’m so glad you liked it, thanks for sharing! Tried this tonight and LOVED IT! We made some slight modifications based on what we had on hand – no sun dried tomatoes, and crushed almond instead of toasted pine nuts – and I was a little worried that the flavor would suffer because of it, but it was still fantastic. Really one of those first-bite, ‘holy crap this is better than I expected’ moments. It’s been a while since I cooked with spaghetti squash and I was glad to get back into it. Thank you! What would you revcommend as a substitution for pine nuts? My husband is not allergic, per-se but had a reaction to them years ago. Can’t wait to make this for Thanksgiving! Hi Tera, you could skip them or use chopped walnuts instead. I am reading this combination and it sounds scrumptious! I have a question. Would like to make as a side for Easter dinner. Do you think I could make the day before and just reheat it? Andcto rehest what would you suggest? Hi Debbie, I’ve never tried reheating this one but I think it will be fine. I would just undercook the kale a bit, so that once you reheat it it doesn’t lose it’s vibrant green color. Made this tonight, with alterations: way more chick peas (~2 Cups), more garlic, maybe a bit more kale. It was very, very good. A great meatless option; a definite keeper. Hi Mike, I’m glad you enjoyed it! I’m currently eating this for the second time -I love it!! I LOVED this! Only change was added a zucchini in the beginning to get rid of it and add basically no calories to the dish. I might put the sun dried tomatoes in earlier to get their flavor to permeate more but either way, it was delicious and I thank you so much! Excellent recipe for spaghetti squash and kale. We made as written it with the sun dried tomatoes and Parmesan. Loved it. Hi Wendy, I’m so glad you loved it! OMG! Thank you! Thank you! Thank you! Love this recipe!! Had to use spinach since I didn’t have any kale. And I used the Kalama olives, oh yes!! Made this tonight – My spaghetti squash was really big – Love the recipe! I generally groan with readers saying, “loved the recipe but I changed it to blah blah blah”. Usually the suggestions are less than impressive or helpful. I did it pretty much as you did and wish I’d taken the squash a little further in a hotter oven. My oven’s fault, not your recipe I must add. (Just moved into this house and am still working out the oven). Do you let the skin shrivel or brown? And I love your suggestion of capers or olives as an alternative to the tomatoes. Based on that theme of saltiness, I used anchovies, so thank you for your suggestions. Hi Lucas, ha ha, well I’m glad the recipe was flexible :). I let the spaghetti squash brown a little on the outside, not to the point where it shrivels. Nice n testy recipe.Thanks for sharing. Made this tonight for my girlfriend and I and it came out fantastic! Thank you for this simple and healthy recipe. I have book marked it and plan on making it in the future. By the way, I followed the instructions the way they were but our squash was a bit big so I only used about half. Hi Nick, apologies for my slow reply – I’m so glad you both enjoyed the recipe! It was delicious! thank you for sharing. i will definitely make this again. Hi Katie, I’m so glad you loved the squash! Loved this! I over-wilted the kale a little bit, but the sun-dried tomatoes gave the best punch of flavor. I may double the recipe next time — it’s too good not to have twice! Hi Joyce, I’m so glad you loved it enough to have twice! Just made this and it was delicious! I did double all the ingredients except the spaghetti squash & capers. I love garlic so I used 4-5 minced cloves and left them in. Will definitely make again! Hi Gera, I’m so glad you enjoyed the recipe! I have made this dish three times. It’s become a weekly staple in my vegan home. I had only had spaghetti squash once prior and liked it but thought it needed more. This was it. The kale and lemon and sundried tomatoes!!! I actually feel responsible and loving to myself making it. Clean eating is easier now that I’ve stumbled across this site. Hi Denin, I’m so glad you loved this one too! Yay, for clean eating! This was great! The only substitution was fresh walnuts, they’re local here. I’ll make this again! Thank you! I’m so glad you loved this one too! Thanks for coming back to let me know! SOO delicious! I highly recommend trying this recipe out. One of the best things I have ever made, and its nutritious as well.